This entry was posted in Whole House on November 23, 2018 by doluser. Thermostats are often the culprits when it comes to overheating and overcooling your home. You turn up the heat too high to warm your home a couple degrees, but in an hour your home is too hot and wasting heat. Luckily, now there are newer, smarter thermostats on the market that don’t waste energy beyond your home’s comfort zone. The Nest Thermostat is simple for you to use, but its performance is anything but simple. An un-programmed thermostat can waste up to 20% of your heating bill, but spending time programming your thermostat can be frustrating. 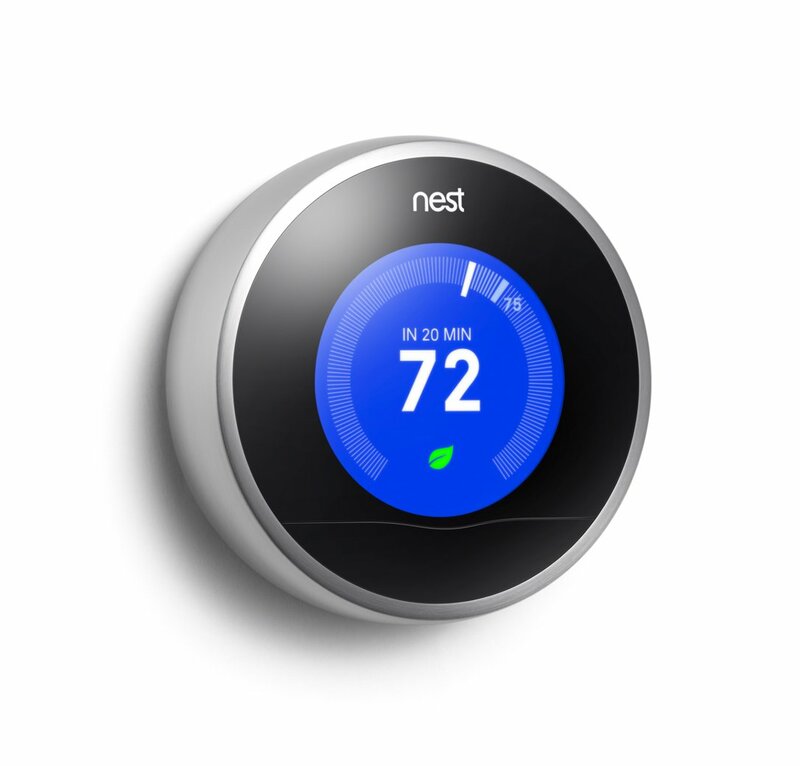 The Nest Thermostat programs itself to bring you energy savings and save you time. The thermostat regulates your home’s temperature after you enter a few pieces of information. First, the Nest Thermostat asks for your zip code. This way, the device knows the outside temperature without ever touching the outdoors. Next, you enter the room the thermostat is located. Finally, you get to tell the thermostat the lowest and highest temperatures to reach when you’re away. For example, you can program your thermostat to only heat to 60 degrees when you’re away, and only cool to 85 degrees. In the first couple of days with the Nest Thermostat, all you need to do is turn it up and down. The thermostat builds your personalized schedule of the temperatures that you want. After just a few days of teaching your Nest efficient temperatures, the thermostat will set these temperatures all by itself. With Auto-Away, Nest even turns itself down if you forget to manually turn it down before you leave. Nest technology allows you to change your home’s temperature even when you’re away. If you have a smartphone, connect with Nest to turn the heat on when you’re on your way back home. You can save energy, but still be comfortable. The Nest shows you when you’re actively saving energy. A leaf icon appears on the face of the thermostat. Turning your thermostat down by just one degree can cut your energy usage by up to 5%. The leaf appears to guide you to energy efficiency. The Nest saves you money on your heating bill, and in just one year these savings pay for the upfront cost of the Nest. Another option for a smart, energy-conserving thermostat is a Wi-Fi enabled thermostat. Ecobee has a product called the Smart Si thermostat that you can control remotely to adjust your home’s temperature. You can create “vacation events,” where the thermostat will control itself during that given time period. The Ecobee Smart Si receives information about the weather outside and will adjust itself accordingly. This thermostat also alerts you when your HVAC equipment requires any service, so you do not need to worry about your HVAC upkeep. The Ecobee can save you up to 26% of your heating and cooling costs. This thermostat is a 7-day programmable thermostat with easy access both directly and from the Internet. Investing in a smart programmable thermostat is an effective way to control the temperature in an insulated home. Save yourself money, energy, and time by installing a smart thermostat, such as the Nest or the Ecobee Smart Si. Contact Dolphin with any questions or for advice in the world of thermostats, insulation, and home energy conservation.